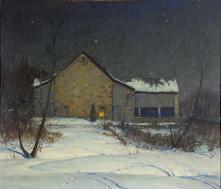 George Sotter, though relatively unknown, has recently been called “one of the most locally popular of the Pennsylvania Impressionists.” (An American Tradition, 1995-96, p. 29). Born in Pittsburgh on September 25, 1879, Sotter began his art education with local teachers and with Henry G. Keller, who had studied in various German academies. Keller, known for his superb, atmospheric watercolors, taught at the Cleveland School of Art but Sotter studied with him in Pittsburgh. Later Sotter would exhibit between 1903 and 1937 at the Pennsylvania Academy of the Fine Arts. His works were also shown at the Corcoran Gallery (1912-23), the Carnegie International (1901-26), the National Academy of Design (1913 and 1921), and at the Art Institute of Chicago (1911-27). In 1915, Sotter exhibited four works at the Panama-Pacific International Exposition in San Francisco, where he won a silver medal. Sotter was known mainly as a stained-glass artist; his work may be seen from New York City to Salt Lake City. Around a dozen craftsmen worked under him for these commissions. Sotter spent the summer of 1902 with Pennsylvania impressionist Edward Redfield in Boothbay Harbor, Maine. Between 1910 and 1919, Sotter taught at the Carnegie Institute of Technology. His paintings often feature large areas of sky filled with clouds and he frequently painted winter night scenes, such as Moonlight, Bucks County (Beacon Hill Fine Art), a perfectly successful depiction of a quiet, moonlit landscape filled with twinkling stars. Star-studded skies, although rare in landscape painting, go back at least to 1600 when they appear in the oeuvre of Adam Elsheimer (1578-1610), a German painter who worked in Rome. The early eighteenth-century series of landscapes dedicated to the planets by the Bolognese master Donato Creti (Pinacoteca Vaticana, Rome) also feature stars, but one might also think of Vincent van Gogh’s famous Starry Night of 1889 (Museum of Modern Art) when searching for precedents. Sotter’s Moonlight, Bucks County has an atmosphere of fantasy and nostalgia that one associates with American illustration and especially with Maxfield Parrish and his evocative, dream-like visions. Sotter was given a special exhibition toward the end of his life (1950) at the Woodmere Gallery in Philadelphia. Sotter died at Holicong (near Doylestown), Pennsylvania in 1953. The Bianco Gallery, Buckingham, PA, has been working on a catalogue raisonné of Sotter’s work.